Fine dining, elegant presentation and great wine. Petrus sits just around the corner from the High Street in the heart of London’s swanky Knightsbridge. From the outside it looks quite unassuming, not shouting about either its location or the plenty of fine dining going on inside. I think it’s worth visiting Petrus as much for the theatre and experience of the restaurant as a whole, as for the wonderful food and excellently paired wines. It’s not often I get the chance to go out to a restaurant such as Petrus but this time a friendly voucher for the chefs tasting menu was sitting in my partner’s handbag as we made our way to the restaurant. So my wallet was feeling a little more relaxed as we walked in and took our table. 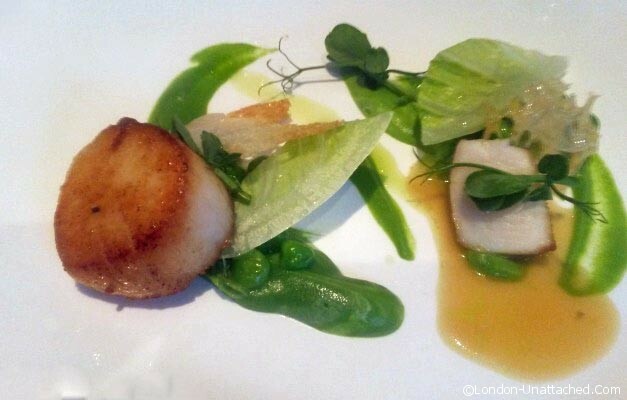 The first thing which hits you about Petrus is that for one of the top rated restaurants in London on TripAdvisor and with Gordon Ramsey’s name attached it is relatively laid back. I half expected giant chandeliers and 19th century opulence but Petrus has a more relaxed and modern feel. If like me you are used to dining in some of London’s more modest places then the amount of attention you get from the staff (two people were serving each course to us) could almost feel disconcerting if they weren’t so good at putting you at ease. On to the food and wine. As I mentioned we were using a gift voucher for the chefs tasting menu which consists of 7 courses from starter to dessert. I buried myself in the enormous (over 35 pages, but nothing less than what you’d expect) leather-bound wine list and chose a half bottle of the 2012 Daniel Dampt, Chablis figuring it would go with most of the menu, though I’m sure connoisseurs will point out where I went wrong. 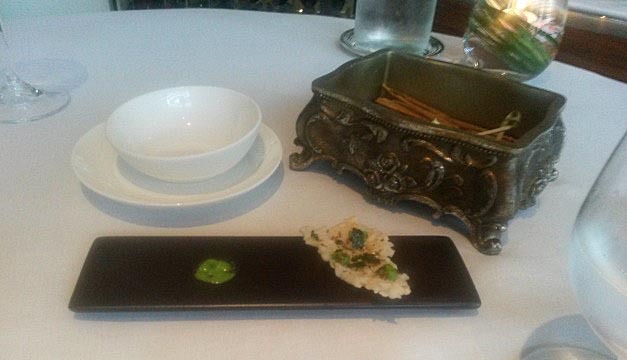 What comes before an Amuse bouche? In our case it was one of these oriental crackers with a dusting of perfectly crafted wasabi, not too hot. Along side we had a tender bite of succulent chicken on a skewer. 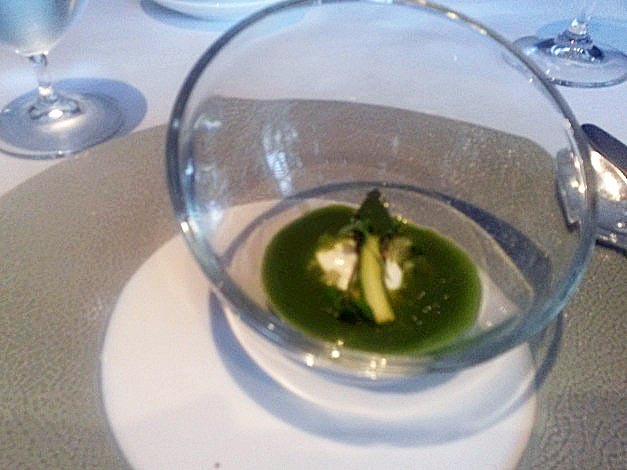 This was swiftly followed by an Amuse bouche of green gazpacho with goat’s cheese This was just enough to tickle your taste buds ready for what was to come. 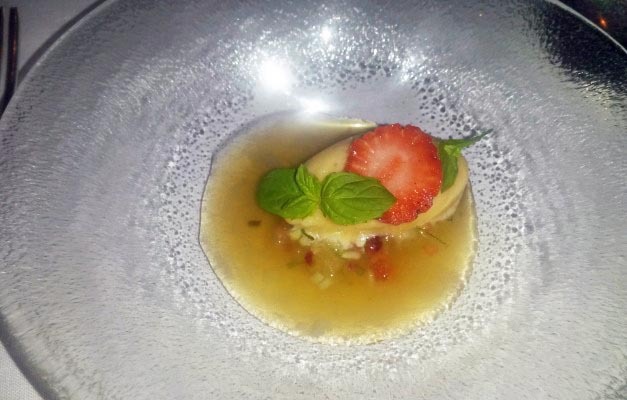 There was just a little of the goats cheese surrounded by perfect drizzle of gazpacho delicately poured at the table. 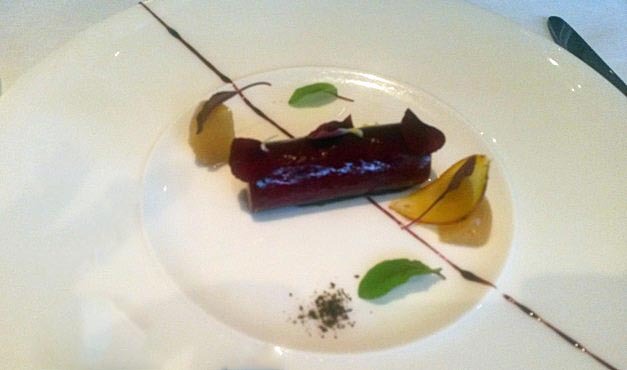 Next it was on to a foie gras parfait with golden beetroot, port and voatsiperifery pepper. I really enjoyed this as I fell in love with foie gras on a trip to the Dordogne and don’t get to have it that often. The presentation was again excellent, though I could have done with just a little more of the reduction draped across it. This was followed up by the first fish course, roasted scallops, peas, lettuce, lardo di Colonnata, crème fraîche and lemon thyme. This course went down a treat. I did have to check up on lardo di Colonnata which is an Italian pork product. What stood out was the classic pairing of pork and seafood surrounded by a generous portion of greens. I felt this cleaned the palate well after the rich Foie gras. On to something more meaty, a healthy piece of Cornish monkfish tail with roast cauliflower, wild garlic, nori seaweed and smoked mussels. 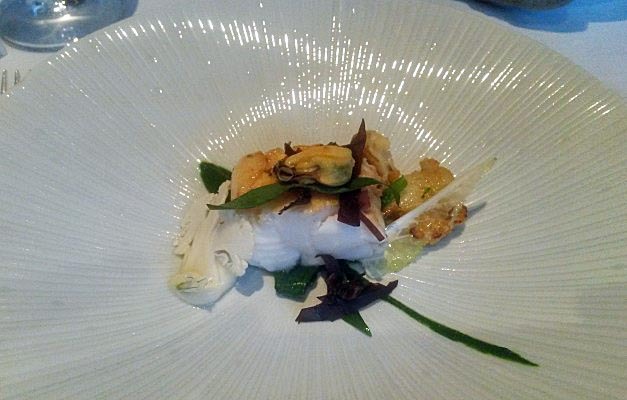 Though my partner adored the monkfish for me the hero of this course was the roast cauliflower, It may sound like a strange one to pick but it is often done in a half-hearted way, unlike this. Again the presentation was excellent, touches like the shell-like plate go a long way to create a nice atmosphere. So here we are at the main course. You have a choice between two options. Black Galloway ox cheek with alliums, smoked bone marrow and shallot sauce, or Goosnargh duck with honey, lavender, fennel, blood orange, radish and scorched cos lettuce. We both went for the duck, my partner taking the chefs recommendation for medium rare and me plumping for as rare as they can do it. Maybe I missed out on something by having it this way, but it’s how I prefer my meat. This was my favourite course. 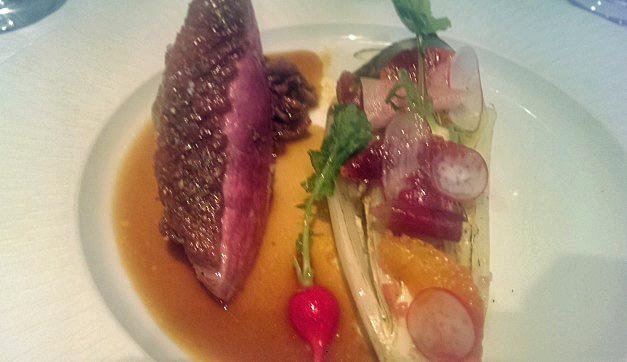 The duck was seasoned and cooked to perfection, blood orange is a great alternative to the usual orange you get and the hint of lavender in the background elevated what could be a heavy dish with duck and honey and made it feel light (or maybe that was just the wine helping me along?). By this point I was getting pretty full,which is something that doesn’t happen too often and I hadn’t expected it to this evening. Before the dessert we had a small sorbet of Pimm’s cocktail served with iced chai tea, poured at the table. All the elements of a Pimm’s were there though I hoped not too much Pimm’s itself. By this point I wondered if I was up for what sounded an indulgent finale, chocolate sphere, milk ice cream and honeycomb. Well, that was until it arrived in front of me. Had I known what was going to happen I would have switched to video mode on my phone quickly, but nevermind. 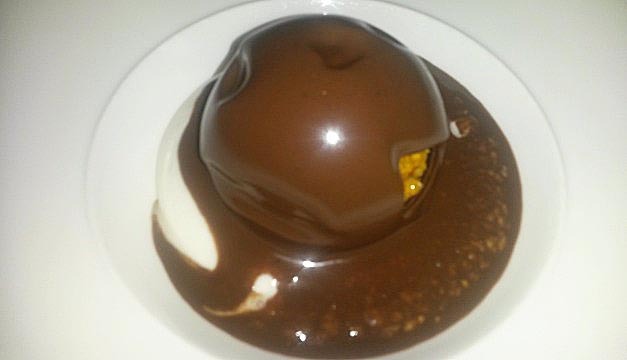 The chocolate sauce poured over the sphere is warm and almost instantly melts the dome to reveal the honeycombe inside – now laced with molten chocolate and ice cream. After a coffee the meal was over all too quickly, though looking at my watch we had been there for over two hours. I guess time does fly when you’re having fun. Petrus isn’t a restaurant for everyday, without our vouchers the tasting menu would have been £75 so not the end of the world but equally not for all the time. don’t forget if you do try this menu there will be the amuse bouche, wine, coffee and drinks to add on as well. But with food, drink and service like this, you really can’t complain. This meal is so utterly beautiful..the green gazpacho with goat cheese strikes me as lovely and interesting. I think you all eat more beets than we do..and you say beetroot. Wow sounds and looks incredible. I am not a huge fan of scallops, I wish I was as they look delicious. And I am a sucker for desert .. chocolate, ice cream and honeycomb … sounds like heaven on a plate! Sounds absolutely incredible.. and looks even more so….. but definitely must have been a huge treat too.